When Kia revealed the new Soul, it wasted no time rolling out the electric version alongside it. The automaker just didn't say how far the new battery-powered vehicle would travel on a single charge. But now the EPA has released the Soul EV's range, and it's literally miles better than the model it replaces. 132 miles, to be specific. 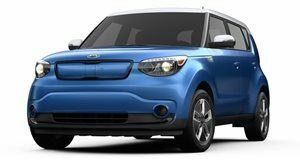 According to the US Environmental Protection Agency, the 2020 Kia Soul EV can go up to 243 miles before needing to stop to recharge. By comparison, the 2019 model could only go 111 miles. That's a pretty impressive improvement, even if it's not as long a range as the 258 miles boasted by the Hyundai Kona Electric with which the Soul EV shares its battery pack. It is, however, four miles better than the Kia Niro EV's 239 miles, and five miles longer than the Chevy Bolt's 238. But it's a bit shy of the Tesla Model 3, which will go for 264 miles even in "mid-range” spec. The new Soul EV boasts an electric powertrain capable of delivering 201 horsepower and 291 lb-ft of torque, juiced by a 64-kWh battery pack. In other metrics, the EPA rates the 2020 Kia Soul EV at the electric equivalent of 127 miles per gallon in the city, 101 mpg on the highway, and 114 mpg on the combined cycle. It's estimated to cost $600 to power each year, which works out to take just 98 cents to drive for each 25 miles. That works out to a projected savings of $3,250 in fuel costs over the course of five years, compared to the average new vehicle on the market, though of course, that depends largely on how much your local power company charges for electricity.